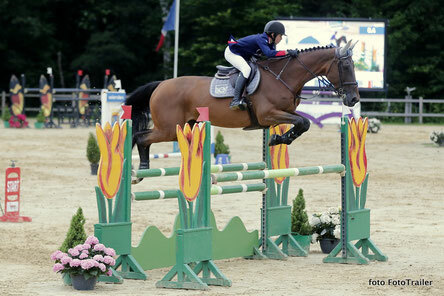 Jules Orsolini from France was the best in the Spring- en handelsstal Robert Vos Prize for Children at 1.30m level. In this Against the clock he finished with Roxana des Etisses (Quick Star) in 52.62 seconds. Exactly 2 seconds later finished the British Jodie Burchmore Eames with Casti Aneira (Lupicor).Jerome Schmidt (BEL) with Etoille, Oliver Fletscher (GBR) with Dahar (Quasimodo van de Molendreef) and Sarah Schluchter (SUI) with Dubrovnik (Guepard de Brekka) closed the top-5.